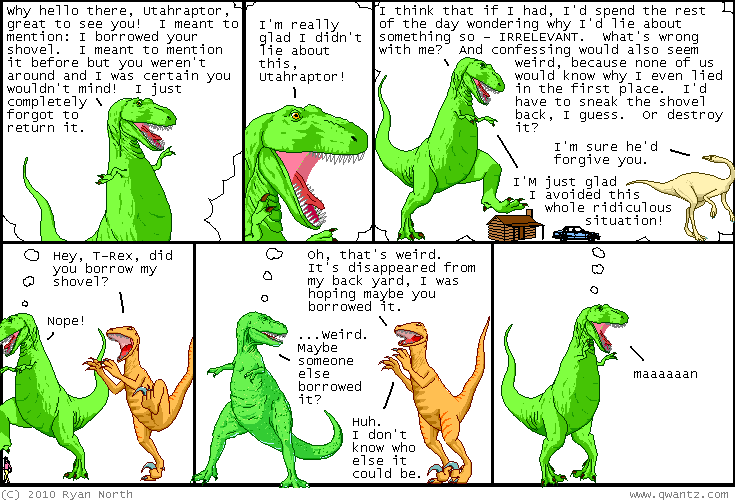 Dinosaur Comics - January 14th, 2010 - awesome fun times! –Someone must have gotten it right by now! January 14th, 2010: I'm sure you've heard about the earthquake that affected Haiti, the poorest nation in the western hemisphere. It's done a lot of damage too, and thousands have lost their lives, while thousands more have lost their homes and need shelter. I'd encourage you to make a donation to organizations that can help! MercyCorps is doing good work, as is the Red Cross, Doctors Without Borders, Partners in Health, as well as tons more other organizations: you can probably think of a few. Please donate some money if you can! Yesterday's comic (which involved planning who you'd try to see in the case of the known, foreseen disaster of a meteor impact) contrasted pretty poorly with the news of the earthquake that most of us woke up to. I write these here comics a few days in advance, and they go up on the site semi-automatically. When I published the comic I didn't make the connection with Haiti that I could've, and I had two readers (just two, but still!) write in to let me know that maybe I hadn't realized it, but this latest comic was not in the best taste, especially after millions are dealing with a disaster that happened, without warning, in real life. I agree, and if I'd realized this at the time, I wouldn't have put the comic up. So here's tomorrow's comic up a bit early. I'm really sorry for any offense I've caused - the comic went live only out of thoughtlessness, not from malice. Again, please donate some money if you can! It will help some strangers out in a very difficult situation, and there are few things you can do that are better than that. One year ago today: it's like turtles with mutagen. it happens in seconds! !